Yes, we are almost there! The 65th Annual Miss Universe Pageant has entered its last week, and we are just a few days away until the all-important preliminary competition. The overall mood is getting more intense as we are seeing many girls who are already showing their competitive spirit! The usual sweet and bubbly looks are slowly changing into gentle fierceness, as these candidates are now feeling the pressure of winning the elusive crown. 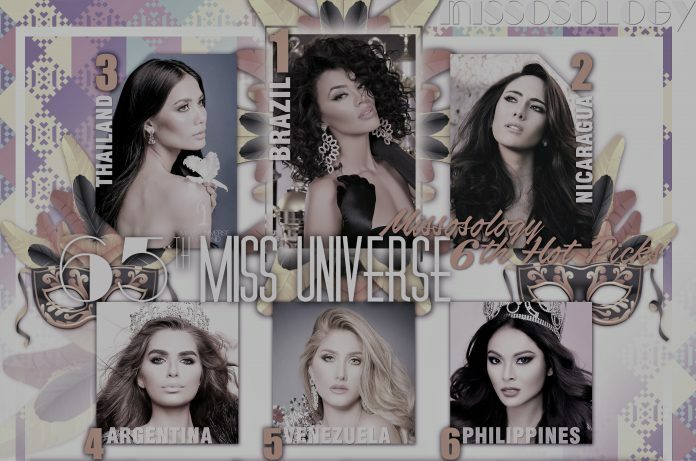 Now onto our sixth and last hot picks prior to the preliminary competition, let’s get to know who have sustained the momentum and became the hottest items among pageant analysts and fans! Please take note that we have also revised the format of our hot picks after we have learned that the Miss Universe this year will have a Top 12, instead of the usual Top 15. The new 12-9-6-3 format has greatly affected our judgment and analysis as to how the girls will fare in the competition. For the very first time, we placed on the No.1 spot the ebony goddess from the land of samba and host of last year’s spectacular Olympic games: Brazil’s Raissa Santana is proving that she is indeed a force to reckon with. We mentioned in our previous hot picks that many people were getting tired of her usual hairstyle because it appeared, at least to us, that she did not have any other look aside from the huge curls. Since then, we have seen vast improvements from Raissa as she has been spotted with different hairstyles, which is actually doing more wonders. Being Miss Universe means that you have to be confidently beautiful, and along with that comes the idea that you can be versatile with many different looks. But most importantly, Raissa has been winning many hearts since the day she arrived in the Philippines. With her lovely personality, those who have been following her on Instagram can probably relate when we say that she has a very infectious giggle. It will be historical if we will have two black beauties as the reigning Miss USA and Miss Universe winners, which is something that has never happened in history. But, will “political correctness” force the judges to choose someone with different racial pool in order to send a message of diversity among the winners of the Miss Universe system? The current Miss Teen USA, however, is a Texan blonde. Brazil’s Raissa Santana, spotted with a fancy headdress, which made her stand out. In second place is Nicaragua’s Marina Jacoby, who was also our top choice in our last hot picks. Marina is an athlete who is known for her discipline and hard work. While we believe that Marina is perfectly capable of becoming a great Miss Universe due to her physical attributes, character and intelligence, what is going to hurt her chances of winning is the fact that her country has no sash power at Miss Universe. But, will this be the year when Miss Universe finally crowns a central American country that is normally being sidelined in the competition? The last time that a Central American was noticed in this pageant was in 2002 when Panama’s Justine Pasek became 1st Runner-up during the live telecast. She later on inherited the title when the original winner, Oxana Federova, stepped down. Nicaragua only placed three times at Miss Universe, and their best placement was a Top 10 finish in 2007, courtesy of Cristiana Fixione. Marina could make history by becoming the first Nicaraguan to enter the winners’ circle at Miss Universe, and could even better the performance set by her runner-up at Miss Nicaragua, the equally beautiful and smart Brianny Chamorro, who was 3rd Runner-up at Miss International 2016. Meanwhile, in third place is Thailand’s Chalita Suansane, whom we believe is the most consistent delegate at this year’s pageant. We have never seen Chailta with a bad wardrobe, and her make up has always been spot on! She also has a great personality as evidenced from the videos that we have gathered about her. Chalita’s rise to fame is not surprising at all, considering the fact that Thai beauties are normally being appreciated in the Philippines. In fact, there had been numerous times when Thai delegates were crowned as Miss Asia-Pacific on Philippine soil, aside from the numerous runners-up that they have amassed during the old times. No one can deny that as the days pass by, leading to the finals, Chalita is the one who is standing out among the Asian delegates. It seems that her energy will never run out until until the final night, and we can only expect the best is yet to come. We now know that she is armed by a great team who are dead serious to win the Miss Universe crown for Thailand, and to bring back the smile to the Thai people who lost their beloved monarch, King Bhumibol Adulyadej, last year. At fourth place, Argentina’s Estefania Bernal is back near the top as she regained her momentum. Thanks to her amazing stage presence, it will be an injustice if this South American super beauty is denied of a spot in the Top 12. She is one of the strongest Latina beauties this year, and her overall look and personality scream “Miss Universe”. She also possesses a very likable personality, and is said to be a softer version of last year’s runner-up, Ariadna Gutierrez. Venezuela’s Mariam Habach is currently in fifth place, and so far, she has already received two special awards from pageant sponsors. Indeed, the power of the Venezuelan sash cannot be underestimated, and truth to be told, there is no blonde beauty this year who is really more of a standout than Mariam. Her swimsuit body is one of the best this year, and if she makes it to the Top 12, it will be another easy way up to the Top 6 for Venezuela! Host delegate Maxine Medina of the Philippines has slid to sixth place, but this should not dishearten her Filipino fans who are considered as the most die-heard pageant fans in the world. This year’s Miss Universe format will have a Top 6 QA from the judges. If Maxine survives this round with a convincing response, she can make a back-to-back win possible, as the final three will only be ranked based on overall impression. Australia’s Caris Tiivel is now in seventh place. Her recent appearance has proven us wrong when we had written her off at the previous hot picks. We just wish to see Caris with a more glamorous look as we noticed that she has been sporting a typical “I don’t care about my hair” look even on formal occasions. But no one can ignore this demigoddess from the land down under, as she is considered by many as one of the prettiest delegates this year. Miss Universe China 2016 Li Zhenyeng during her national pageant. Following her at eight place is the tall and statuesque delegate from China, Li Zhenyeng. Also known as “Joyce”, Li is currently working in the dynamic city of Shanghai and was crowned Miss Universe China in a glamorous event last year. Her porcelain skin was admired by many during the swimsuit presentation in Cebu. With a look that is distinctly oriental, and a physique that is perfect for high fashion runways, Li can become a surprise winner at this year’s Miss Universe. And before we forget, she is fluent in English too! At ninth spot is Jamie-lee Faulkner of Great Britain, a pageant veteran who already has an international title on her résumé. This former Miss Scuba International winner tapped the ingenuity of a famous Filipino designer to do her competition gown. No British woman has ever won the Miss Universe crown, while there had been a couple of times when the delegates from Wales and Scotland had almost captured the crown, before they ceased to compete separately. Will Jamie-lee be the first? Spain’s Noelia Freire is currently in 10th place, thanks to those fans who have personally met this Spanish beauty. Noelia may not be that photogenic, but she is said to have a winning aura whenever she appears to the public. The last and only time that Spain had won the Miss Universe crown was in 1974, when the Philippines first hosted the pageant. Hosting the pageant in exotic countries may prove to be a good thing for Spain. In 1999, they were 2nd Runner-up when the pageant was held in Trinidad Tobago, while in 2000, they got the same position when the pageant was held in Cyprus. When Vietnam hosted in 2008, their delegate was 6th, missing the Top 5 by a few points, while in 2013, in Russia, they almost won their second crown when Patricia Rodriguez was declared 1st Runner-up. Miss Universe Malauysia 2016, Kiran Jassal in her official portrait. At 11th, Malaysia’s bet, Kiran Jassal, is finally recognized in our hot picks! Many pageant fans believe that with a “weak” Indian delegate this year, Kiran may compensate for it. This stunning young woman is from a family of law enforcers and is currently studying to become a dentist. With her stunning look and piercing eyes, Kiran is poised to become the second Malaysian in history to enter the first cut at Miss Universe. And to complete out Top 12, we have the 19-year-old Alena Spodynyuk of Ukraine, who is another sports athlete competing at this year’s pageant. If you remember, Alena was our No.1 choice in our first hot picks. We may have seen a little bit of inconsistencies from her since her arrival, but it cannot be denied that her classic Eastern European look makes her one of the classiest looking delegates this year. She is one of a kind! Shannon Harris of Barbados went down to No.13, but we will be keeping an eye on her during the preliminary competition because she is one of those delegates who has a lot of believers who are not even Barbadians! It just goes to show that even if you’re from a small island, if you’re really outstanding, you can easily get the nod of most people! Belgium’s star maybe slowly fading after the major revelations she had shown us during the Cebu swimsuit competition, but Stephanie Geldof (No.14) is just too gorgeous to be ignored. Mexico’s Krista Silva needs to step up her game as she is now being overtaken by the other Latinas, She is now ranked 15th, and with the current MU format, she might miss the first cut if she does not do anything to improve her styling. And at 16th place is Sierra Leone’s Hawa Kamara whom has gotten a lot of people’s attention because of her unusual short hair. Indonesia’s Kezia Warouw is in 17th spot, and is back in our ranking. Meanwhile, Peru’s Valeria Piazza is in 18th spot. She is one of the few delegates this year who was crowned by Pia Wurtzbach during her national competition. USA’s Deshauna Barber is currently pegged at 19th spot, while Colombia’s Andrea Tovar completes our Top 20. Chile, Dominican Republic, Guatemala, Korea and Finland earned the spots as honorable mentions, and we will also keep on eye on them during the preliminary competition and see if they are worthy to be elevated into our final hot picks. The preliminary competition of the 65th Miss Universe pageant will be held at the SM Moa Arena on January 26th (Thursday) 7:00 PM Manila time. After that, we will be scrutinizing the overall performance of each delegate and choose who will be the major shoo-in for the crown. In the meantime, keep on voting for your delegate to earn a spot in the Top 12!